I plan on trying to do a video for this technique sometime soon. I used a background from the August Kit of the Month from Unity Stamps on watercolor paper, then used what I will call a "reverse smooshing technique" - basically smudging some MFT dye ink on some acetate, then wetting the paper instead of the acetate, then smooshing it over. I let it dry between each color, and then misted with Heidi Swapp Color Shine in gold. Added some gold thread, a few gold Pretty Pink Posh sequins, matted in some coordinating cardstock, and on a card base which I used Lil' Inker's Cover Up Die: Stitched Woodgrain. 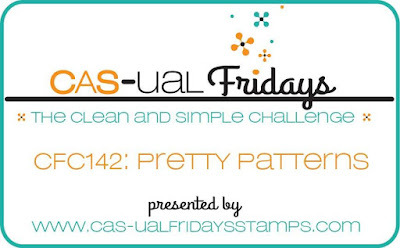 And thanks so much for joining us at CAS-ual Fridays! The background looks amazing, what a lovely card.